This is Vuchko's welcome home routine every night. He's a 4 month old mini red short-haired dachshund. 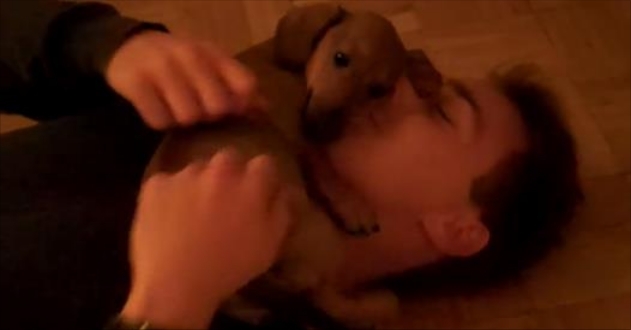 At first, the Dachshund puppy in this video seems a bit sad. He stares at his pee pad on the floor, which is right next to the front door. “Why won’t anyone play with me?” he seems to be thinking. But after just a few seconds, we see the door swing open, and the little pup’s tail starts wagging with excitement. Dad’s home! It can be overwhelmingly exciting when you finally get to see a loved one in person after a long day’s work. This Dachshund sure knows the comfort of being loved; he must know how irresistibly cute he is, rolling all over his guardian’s face like that. We love coming home to our pet babies, with their adorable little faces, wide eyes, gigantic smile and knack for jumping all over us. We wish we could jump into the frame and get some of that puppy love, too! The Dachshund is curious, clever, lively, affectionate, proud, brave and amusing. Devoted to its family, it can be slightly difficult to train and housebreak, but not impossible. Dachshunds travel well. This little dog needs an owner who understands how to be his pack leader or he will take over the house, and begin to try and tell the owner what to do. Responses to "Dachshund Puppy Goes Crazy When Dad Gets Home"